If your Xbox or Xbox 360 S Console is not loading games or DVD movies or occasionally displays a disc read error then you've come to the right place. This issue is usually caused by a worn out or fading DVD laser. It's a very common issue with the Xbox 360 Slim/Original and usually happens because the DVD laser that reads the discs has a limited life span and will eventually wear out over time. If you insert a disc or game into the Xbox 360 and the DVD tile on the dashboard displays any of the following messages: "This disc is unreadable", "Unrecognized disc", "To play the disc, put it in an Xbox 360 console" or “Reading” and then “Open tray” then this is the repair you need. This repair will fix the open tray issue guaranteed! In rare cases, the entire Xbox 360 optical drive may need to be replaced and there may be an extra fee if an advanced repair is necessary but rest assured it will be fixed as long as it hasn't been damaged due to tampering (we may still be able to fix those too if you're wondering). You should always try a DVD lens cleaning kit before sending it in for repair, unless your system is a few years old, in which case it's almost certainly an issue with the laser. Other symptoms of a worn DVD laser include games taking forever to load or Xbox 360 games showing up as DVDs. This service is your best hope to fix your disc reading problems on both the Xbox 360 Original and the Xbox 360 S (Slim) consoles. Valuable Tip: After having this repair performed, it would be wise to copy your Xbox 360 games to the attached hard drive (if you have space) to save wear and tear on the laser. You will still need the original game in the drive to verify that you do in fact own it, but after verifying the game, the system will then proceed to read the game files directly from the hard drive rather than the game disc. This will extend the life of your Xbox 360's DVD Laser. It also improves load times for most games! To install an Xbox 360 game to the hard drive, insert the game into the DVD drive tray (if the game auto-loads exit back to the dashboard), browse to the games tile and press the 'Y' button on your controller. You will be presented with a menu and the option to Install to Hard Drive. It takes about 7-10 minutes on average to install a game. 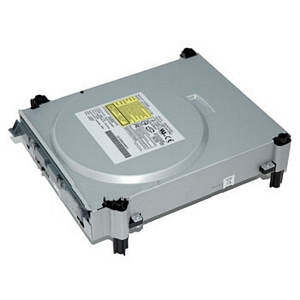 Just click the Add to cart button below to have your Xbox 360's DVD Drive repaired by an Experienced Gaming Console Repair Tech. Our Wii now reads all games and DVDs. Thank you for getting it fixed so quick! I had my Xbox 360 repaired by Console Repair Guy a little over a year ago. It had the dreaded red ring of death. It does sound a little louder because of the fan mod but it's still working perfectly! Thanks again, I owe you one! Thank you so much for fixing my PS3! I can finally watch my blu-ray movies again and it didn't cost over $200 which Sony tried to charge me. My 360 now reads all games and DVD's perfectly after having you replace the laser for me. I can't belive how fast you were able to fix it! Thank you so much! Xbox is still going strong. Keep up the good work! The console repair guy had my PS3 fixed in less than 2 hours. He even ordered the parts for me and it still works.